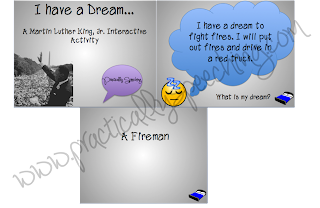 Use this fun, interactive game to teach your students about dreams, and Dr. King's "I have a dream" speech. This powerpoint game uses inferencing to go through many peoples dreams. Students will infer what this person's dream could be - i.e., doctor, lawyer, singer. It's a great intro or wrap up activity for MLK, Jr. Day! Your kids will have fun trying to "guess" who this person is and what their dream could be. At the end, the question "what is your dream?" is presented. Have students go around and present what their dream is and why!